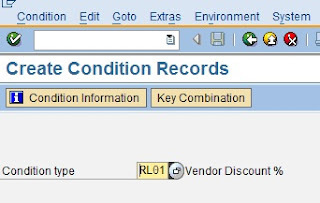 SAP:How to Create / Edit / Delete Vendor Discount Conditions ? Vendor Discount Conditions are maintained to add discounts automatically when creating new purchase orders. To create a vendor condition go to MEK1 and select the "Condition type" . press F4 to list all condition types. The condition type indicates, for example, whether, during pricing, the system applies a price, a discount, a surcharge, or other pricing elements, such as freight costs and sales taxes. For each of these pricing elements, there is a condition type defined in the system. Few of them are given below . 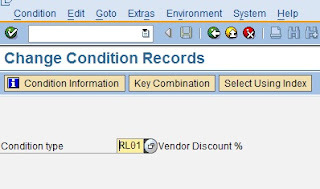 Select RL01 Vendor Discount% from condition type and press "Enter". Then you will be asked to select the Key Combination ... Just select "Vendor" from those options and press Enter . "Create vendor discount % condition (RL01): Fast Entry" window opens.. Enter your Purchase Organization then enter the Vendor account number and the amount .. then fill the Valid from and Valid to field and click Save button. A new condition is now created for that vendor. From now onwards this vendor discount condition will be automatically assign to all Purchase orders created for this vendor. Using transaction MEK2 you can edit Vendor discount condition. Go to MEK2, then select the condition type (for eg: CUAS - Customs exemption %) and press enter , then select the key combination from the list , press enter. Now you will get a screen to fill these details. Purchase organization, Vendor, Valid On. Here you can edit the vendor condition . To delete a vendor condition , just select the condition line and press the delete button shown at the bottom of the screen and then click the Save button.